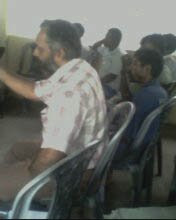 All Inland Fisheries Organizations (Karuwalagawewa Praja Shakthi Development Foundation, Kurunegala Praja Sahayogitha Foundation, and Polonnaruwa Inland Fisheries Organization) , which are affiliated to the National Fisheries Solidarity Movement (NAFSO) gathered at Ibbagamuwa SANASA seminar hall, which is located in Krunegala District and all these inland fisheries organizations were convened by NAFSO’s Kurunegala District partner organization “PRAJA SAHAYOGITHA FOUNDATION” . This integrated meeting was held in 27th February 2008 and especially a new inland fisheries group also joined with this gathering representing from Angamuwa tank in Anuradhapura district as inland fishers group. In search of solutions for the burning issues in the inland fishing industry together with all inland fisheries organizations as a human chain. An activity buildings and to move in to a process of policy, lobbying and campaign is the main objective of this inland fisheries organization’s gathering. 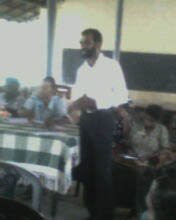 According to that at least 30 representatives from Kurunegala, Karuwalagaswewa, Polonnaruwa and Anuradhapura inland fisheries organizations attended this meeting as well as the National convener of The National Fisheries Solidarity Movement (NAFSO) Mr. Herman Kumara also gave his participation on this for make this a very successful one.  All inland fishers should have the right for fishing in their own reservoir or tank and this organization need to work together with inland fishers for allowing them to involve in the activities of tank management and to protect the inland water bodies.  An animation process is needed to change the attitudes of fishers.  The prevailing act on fishing gears is needed to be amended through the lobbing activities to take the right of fishers for fishing in a legal way in the small inland water tanks.  Concerning the government policy on fishing gears.  Awareness programme for small groups in each reservoirs and this should be done in the district level.  Sending post cards in district wise pointing out the needs of amending the prevailing act on small tanks.